This morning I carried my two wedding dresses to the end of Ocean Beach Pier. I’d planned to drop them at the dry cleaner shop down the hill but when I found it closed, I decided to alter course and head away from the cliffs to town where there was another one. That one was closed too. So I just swung them along in the plastic bag I’d stuffed them into and carried them with me. I carried them with me to the end of Narragansett where the ocean crashed against the boulders below, biding its time. Sooner or later it would prize them loose. 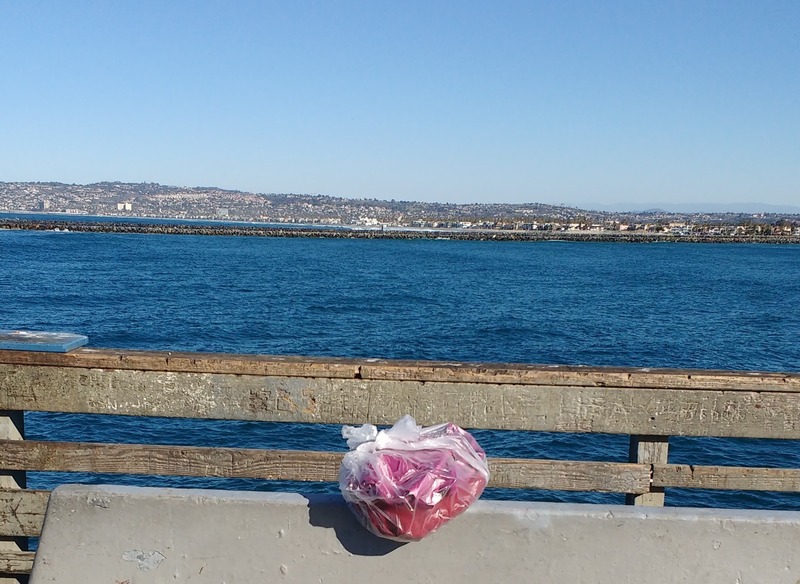 Then my wedding dresses and I sauntered towards the Ocean Beach pier where the morning walkers, fishermen, dogs and seabirds crowded the rails, looking over the edge for fish or back onto the pavement for scraps. This is how my walks go. I start out with one thing in mind and something else entirely happens. It’s the same with my plan to walk 15 miles a week in 2015 which would add up to roughly 800 miles in a twelve-month period. I thought that some of these miles would cover the California Coastal Trail. By the time the year ends, I will have traveled only 420 miles give or take. I’ve traveled most of these within a five-mile radius of my house. The exceptions are exceptional: fifteen miles in the calli of Venice, Italy, three more in the labyrinth of the complex at CERN outside Geneva, Switzerland, twelve among the fruit stands, orchards, farms and paths that line the river to my son’s home in Palisade,Colorado. You could say I’ve walked approximately 150 miles of the California Coastal Trail or you could, more accurately, say I’ve walked the same three- to seven mile stretch of it over and over again. I’ve walked to the library, the drug store, to church, to meet friends in Ocean Beach, Shelter Island, or Liberty Station. When I carry anything, it’s a few Kleenex (you can’t count on finding t.p. in a porta potty or public restroom), a camera or phone, my backpack with some shopping bags, maybe some library books. I wore one of the dresses when I married my husband nearly fourteen years ago. The other is not, technically, a wedding dress. It was the runner-up, the one I would have worn if I hadn’t found the raspberry silk Nicole Miller on one final desperate day of shopping with my mother. The runner up is a rich, deep red with a neckline that makes me feel a little like Audrey Hepburn. That’s the one I want to wear on our anniversary although I have no idea why. It’s not as if we are going anywhere or doing anything. I don’t have shoes for it. I guess I just want to give it a chance to do what it was made to do before the dress and I go our separate ways. As for the original, well, I decided that cleaning it couldn’t hurt. We’ll see what happens after that. Here’s what happened when I stopped at the end of the pier to snap a photograph or two of a pelican. I placed my bundle on the back of a bench and began to click while the pelican eyed me with little interest. A gull, though, edged its way toward the bag with the dresses. I snatched it back up, tucked it under my arm, and kept moving. I wondered, though, what it would feel like to see the gull light on the bag, tear it open and then pick at the dresses or carry them aloft. I envisioned them in the water floating like lost autumn leaves before sinking into the depths. We carry our pasts with us wherever we go but this is the first time I’ve carried tangible pieces of my past on a walk. The bag was light enough and I guess I’m not ready to let the contents go. I don’t wear dresses much any more. For work I mix and match t-shirts and sweat pants. When I walk my most familiar routes, I wear sunscreen, baggy pants, smart wool socks, hiking boots and giant sunglasses. I look like the Maxine character featured on those Hallmark cards women give to each other when they reach a certain age. Which I guess means me. No one is looking. No one is listening. Mostly, I am the one doing the looking and listening. I like it that way. For the most part, my walks have been solitary although the exceptions to this have also been exceptional and very welcome. The writing that I thought would come from my walking hasn’t shown up on my blog. I sat down this afternoon to write something, anything. To try to capture the glimmers each walk produces, that are now part of me. They aren’t forming a complete, coherent narrative. The images are all in motion, like movies that replay. Trying to harness them now is like chasing fireflies with an empty mayonnaise jar. My journal shows a collection of phrases, ideas, observations and mile counts that swelled and dwindled through the course of the year according to my focus, health, whatever was going on with my writing, my family, the effort it takes to be fully present. Sometimes I am just too overwhelmed with the possibilities that spring up with each step. The stories playing out in front of me. The ones forming in my head. The fragments of overheard conversations that make me want to turn and follow the speakers until I’ve got it all. It’s not until I return to my desk that I realize how much my time spent traveling even a small distance by foot has shaped me and my writing. My body is aligned, energized. The muddle on the page I’d left has sorted itself out. Not every time and not perfectly but enough to make me want to stay with this. As the first of the year approaches, I am ready with some intentions. I will keep walking. I will try to cover more of the CCT from the end of my street towards its end at the border with Mexico. I will walk at dawn, at least once. I will try to walk more miles than I walked last year but if I don’t I will be glad for the ones I have. I will wear the runner-up wedding dress on our anniversary, even if all we do is go to In ’N Out. Maybe we’ll walk there. *This turned out to be my last walk of the year. I didn’t know that, of course, when I wrote the essay. In keeping with not knowing how things are going to go, I was planning to run this earlier but various technical problems ensued which brought me to today. To new starts: wherever they may take us! I, too, hope for more miles next year. In the end though, it’s really not about how far we go or how much ground we cover. I love the way your writing here grew as much from what you didn’t do as what you did. A wonderful reminder that the muse is unpredictable. i’m so glad that you’ll wear the runner up on your anniversary. and i love to write about the things i discover while out walking too – thank you for sharing this. Hey, Beth!!! Nice to reconnect. I loved this, Betsy! There was an element of suspense that carried me along with you, Maxine with Maxine. Suspense, you say? Yes, indeed :I thought those dresses might end up in the sea and was relieved that they became neither flotsam nor pelican amuse gueules. And of course I enjoyed thinking about Rory and his not-so-new-anymore home.